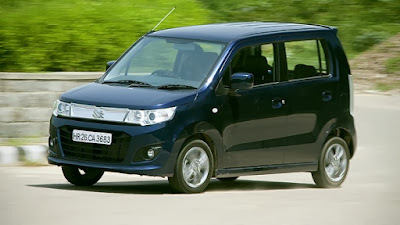 Maruti now has something called the Stingray in India – no relation to the cousin of the shark, with the tail-borne sting; or the classic American 460bhp V8 muscle car. This is not an all-new car. The Stingray is yet another cosmetic update to the current Wagon R, but with more serious scalpel work behind it this time. The Stingray has turned the utterly staid-looking Wagon R into a bolder, livelier looking hatchback. New up front are the restyled bonnet, projector headlamps, flashy chrome grille with LED lights, and massive air dam on the front bumper. It also gets some nice alloy wheels, side skirts – no roof rails – rear spoiler, chrome back door garnish, Stingray decal and snazzy new tail lamp. Open a door and there are prominent ‘Stingray’ strips on the doorsill, plus blue door-well lighting up front. Inside, passenger room all around is generous and comfortable. The blacked out interior extends to the Stingray-theme seats as well, adding a bit of character to the otherwise simple and dull two-tone grey setup in the older car. There’s some additional storage space on the dashboard, a refreshed music system, and in the VXi (O) model that we drove, a leather-wrapped steering wheel as well as chrome bits strewn around the cabin. Turn the key and you’re greeted by the familiar sound of the 998cc, 67bhp K-10 engine that does duty in the Alto and the regular Wagon R. There’s a fair bit of vibration at idle and very little initial punch from the motor at low rpm. Cross 3,500 revs, though, and performance livens up, with a high-pitched whine from the engine. Sound insulation in the cabin is not the best around, and the gearbox isn’t as slick as we would’ve liked. From standstill, it will take a claimed 15 seconds to hit 100kph. On the road, the Stingray isn’t the most refined to drive, and although the electronic power-steered wheel feels heavier now, it retains the nimble handling of the older Wagon R. The brakes have good bite but the pedal felt spongy in stop-go traffic. The Stingray offers exactly what the current Wagon R does – a compact, city-friendly design with generous passenger space and a claimed 20.5kpl. For all that, you pay around Rs 20,000 more over the older model. Will appeal to many, but to some, it may come across as just an aftermarket job on the WagonR.